"`Off with her head!' the Queen shouted at the top of her voice. At this the whole pack rose up into the air, and came flying down upon her: she gave a little scream, half of fright and half of anger, and tried to beat them off, and found herself lying on the bank, with her head in the lap of her sister, who was gently brushing away some dead leaves that had fluttered down from the trees upon her face." 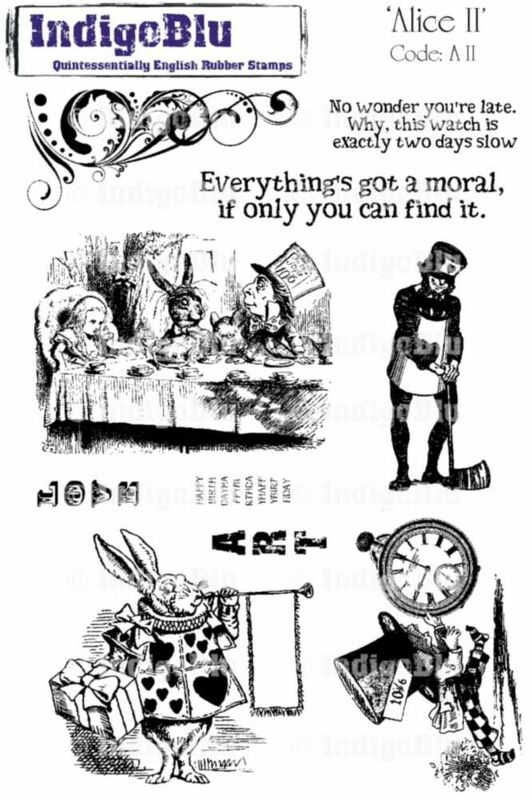 I wonder if the Wonderland story took place in the Fall of the year? Autumn has arrived in the northern hemisphere. Just as Alice recognized the court characters as playing cards, the trees are losing their cloak of green chlorophyll and showing their true colors of gold, burgundy, scarlet, chartreuse and orange are emerging. Your challenge is to show us a project drenched in fall colors! Our prize this month is an A5 sized unmounted stamp set from IndigoBlu (a £13 value), or an equivalent amount of A6 stamps. 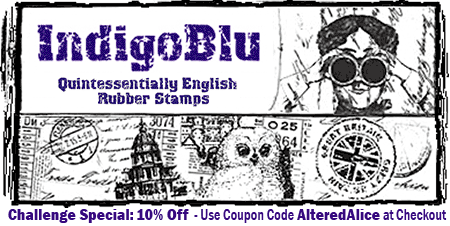 IndigoBlu is a fantastic new British stamp company that makes "Quintessentially English Rubber Stamps" right there in England. The design team will be working with these two fantastic Alice stamp sets, titled appropriately "Alice I" and "Alice II". Most Americans don't know what A5 and A6 mean so I'll just tell you, these sets are really big! 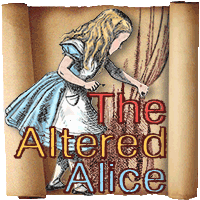 "The Altered Alice readers can take an extra 10% OFF during the challenge; just use coupon code AlteredAlice in the voucher code box at checkout!" For my project I made a domino necklace charm. On the back of a domino I smudged Adirondack alcohol ink (Ginger, Meadow, Butterscotch, Raisin, Copper), then stamped the images from IndigoBlu with Archival Ink. Once dry I covered the top with glossy accents and sprinkled a few microbeads to resemble stars. The edges of the domino are wrapped in strong double sided adhesive tape and then covered in the copper microbeads. I added some fun Tim Holtz trinkets on jump rings. Enter at The Altered Alice by Friday, November 25 (day after the U.S. Thanksgiving holiday); our randomly drawn winner and the honorable mentions will be announced on the last Sunday, November 27. Multiple entries are encouraged, but each must be on a separate post. 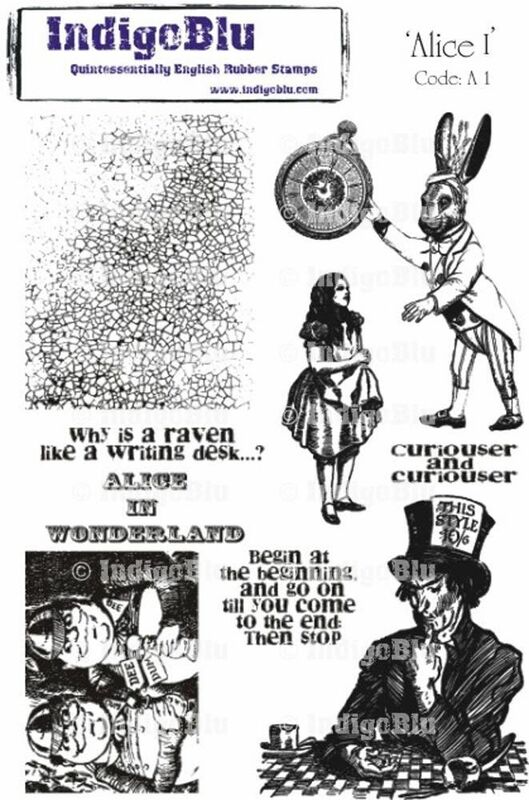 As always, entries that feature Wonderland in some way will get two chances in the drawing instead of one. Wow, I love your domino necklace. The copper microbeads around the edge finish it off beautifully. In case you hadn't heard...I LOVE your Alice domino! Giorgeous - that colour combo is wonderful Erin! A wonderful domino necklace - great colors.